Thunk! 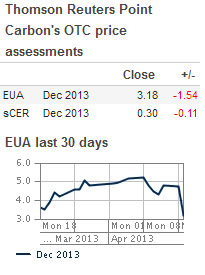 That's the sound of the EU carbon credit inverse hockey stick hitting the floor | Watts Up With That? After hitting record lows back in January, there was a plan to prop up the EU carbon market. That worked…for a while. Then the backloading plan was rejected, and the real market forces took over. Carbon prices hit record lows today after the European Parliament rejected an emergency plan to boost the ailing EU carbon market. In a 334-315 vote, with more than 60 abstentions, lawmakers rejected a proposal to postpone — or backload — the auctioning of 900 million EU Emissions Trading Scheme allowances from the years 2013-2015 to 2019-2020. This measure was intended to rebalance supply and demand, and reduce price volatility. European commissioner for climate action Connie Hedegaard said the plan will now go back to the Parliament’s environment committee for further consideration. They’re trying their best to avoid the unavoidable; it’s akin to the woes of the Euro, except there’s maybe light at the end of the tunnel for the Euro. The Carbon Credit market is on the roof. Soon it will be nearing the edge. Sometime this autumn it may just be swept under the rug and forgotten about. The thud was probably Mme. Hedegaard’s head hitting the wall for the umpteenth time. Heaven forbid that all the desperate shrieking from the Hockey Rinky Tink gets noticed by the MSM as well….. The Chicago Climate Exchange folded some time ago with the collapse of carbon credit prices and the collapse of trading. We’re just lucky so far that the banksters have not yet created a financial bubble around these ephemeral ‘commodities’ that lack even the real estate that was supposed to sustain the Asset Backed Commercial Paper involved in the 2008 crisis. Good news. Kill that nonsense dead and dry up another money making scam for the big banks that only hurts the real economy. Reality is a strict taskmaster. In this information age, it is becoming more difficult to propagate myths and bad ideas for a long period of time. It still happens, but it is just becoming more difficult. With many governments all around the world on the brink of bankruptcy, many of these bankrupt countries are wasting $100’s billions to “fix” the Catastrophic Global Warming “problem” that doesn’t even exist. The financial markets are finally starting to realize this CAGW hoax is a farce and are making trades accordingly; SHORT THIS SUCKER TO Zero!!!! There will be a few smart traders that’ll make a bundle shorting carbon credits. Let us hope that this seriously undermines both the EU carbon market and the Euro, both drivers of poverty, unemployment and misery in Europe – all at the expense of socialist ideology. However, let us not cheer just yet. The EC has a long track record in asking the same question time and again of the same constituency until it gets the ‘right’ answer. I note that Connie Hedupherarse ‘said the plan will now go back to the Parliament’s environment committee for further consideration’. This means that it will be tinkered with by the committee, virtually no changes will be made to the wording or intent and it will come back to the Parliament for another vote. Meanwhile, the thugs of the EC who muscled Greece’s democratically-elected President out of power, and Italy’s democratically-elected president out of power, will have been going round in the interval, either hitting weak MEPs over the head with threats or offering financial inducements (yes, of course, using other people’s money) in order to swing a few votes. As of April 1, Britain’s carbon-emitting businesses pay significantly more for energy than their European counterparts under the UK’s new carbon price floor. The emissions tax, set by the UK government in 2011, starts at £16 ($24.30) per ton of carbon emitted this year and rises to £30 ($45.63) by 2020. The UK’s high carbon price floor represents a threat to competitiveness for British companies, particularly in energy-intensive sectors, warns Richard Gledhill, partner PricewaterhouseCoopers sustainability and climate change. What Richard Gledhill of PWC fails to point out of course is that domestic energy prices are ‘skyrocketing’ (TM Obama) and that energy poverty in UK is rapidly increasing and people are dying – 2000 extra deaths in the first 2 weeks of March alone. The UK politicians do not seem to care about this at all. That number of deaths on the roads in March would have brought the country to a halt all sort of police actions and questions in Parliament. But an extra 2000 elderly people dying from cold isn’t even worth a mention. Taxes are far more important. The sad part of this is that the main scam artists , such has St Gore , have made money when the going was ‘good’ and already got out . Its others that will lose their shirts . I wouldn’t mind getting a tonne of carbon for a few Euro. Will they deliver it to the house, preferably in pebble-sized pieces? As the apparently-endless heating season continues here in central Pennsylvania with a nigh-unprecedented third refilling of the oil tanks approaching, I’m debating the economics of an outside furnace in which I could burn cheap local coal and (late at night) household garbage like cardboard. It could also burn “free for the hauling” scrap wood, but at the known sources with broken shipping palettes etc, these days they are always picked clean! shhhhhhhhhhhhhhhhhhh don’t give Wall St. investment bankers any ideas !!! I took my retirement when I was a teenager and in my early twenties. Therefore I don’t worry about my pension, like those poor fellows who work for the BBC. Their pension fund was heavily invested in carbon credits, as I recall. Of course, in terms of reporting the truth about Global Warming, the BBC has been retired for years now. So maybe it won’t bug them that Al Gore robbed them blind. Just what light is that? The down express coming the other way? The euro is doomed. It was born doomed, it has lived doomed and it will die. Germany is going to leave the eurozone (taking with it all the real money) and the rest will sink without trace, like the Carbon price! Soon only the out of control climate alarmists here in California will have a CO2 tax “market” which will also fail in the long run since the alarmist strategy of mandated global CO2 reduction has in fact already been demonstrated to be an abysmal failure. 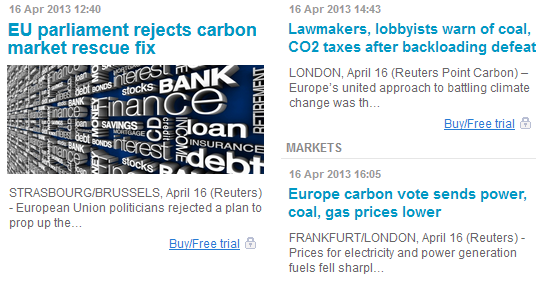 Parliament rejected an emergency plan to boost the ailing EU carbon market. Well at least they didn’t declare it “too big to fail” as obama would have done. Notice how the great democracy that is the EU works. The vote was ‘wrong’ according to Connie so the committee will mull it over. Looks like we (Europe) were a bit premature celebrating victory in the Cold War. The article by the way includes the obligatory scary photograph of water vapor coming out of cooling towers made to look threateningly orange by artful use of sunset. Remember the Roberts rule (John Roberts, Chief Justice US Supreme Court): as long as they call it a “tax”, the government can assume any power, even if specifically prohibited in other parts of the Constitution. If the emission trading scheme doesn’t get enough traction, they will just replace it with a straight tax. I’m rather curious what all the EU governments are going to do about their insane CO2 regulations. Only X grammes CO2 per kilometer driven is now a car sales slogan. You get tax rebates on ‘ecotax’ if you buy cars with the least CO2 output, but ofcourse with electric cars they don’t count the CO2 produced in making the electricity so you pay 0% ecotax. Meanwhile Secretary Swiftboat is droning to our Chinese drone makers about how human caused global WARMING is the biggest problem in the Universe. Many of us are thinking human cause THERMONUCLEAR WARMING by North Korea, Pakistan, Iran or Israel might be a bigger, more immediate problem. Following the advice of Mark Twain….”Never argue with a fool, onlookers may not be able to tell the difference”….the Chinese agreed to keep making our subsidized windmills and solar panels….with their coal fired generators. Having the highest priced statesmanship is not the proper measure of success….but it does demand higher taxes ! At this point, if I were an EU bureaucrat I would cease a percentage of people’s bank accounts and use the money to prop up the carbon credit market (at least until I could get my own money out). In EU bureaucrat speak this would be called a “win-win”. It’s interesting, but without units on the graph, the story is much less useful to the reader. What they are trading is akin to tulips, minus the tulips. Huh? Y-axis was Euros, X-axis was calendar dates. I’ve been thinking and predicting all along that backfilling is just stuffing rags and waste paper in the dike breach. A soggy end is certain. The logical equivalent of re-arranging deck chairs on a ship that’s going down! Never let it be said, though, that the visionaries at the UNEP (promulgator of scary stories since 1972) are loath to “try another way”. The TEEB green advocacy cart with its very own new-fangled money-making-mechanisms “opportunities” is now being driven to the fore. Although even the greenest-of-em-all U.K. Guardian has acknowledged that this UNEP attempt to push nature onto business balance sheets is – in effect – at this point, “Monopoly money we’re talking about”. Co2 trading will follow ‘Tulip mania’ and the ‘South Sea Bubble’ as another example of the Extraordinary Popular Delusions and the Madness of Crowds. The local news on BBC television is reporting that the renewable energy bubble may be about to burst. The WMDs of climate change have still not been found. ***only a surprise to the deluded. read all for the only means left to try to save the whole scam. Global warming is apparently a “gazillion times more dangerous than terrorism” according to Bruce Schneier (2nd, 2nd-to-last questions). If only we’d known. I knew it would turn up in a Boston Marathon story. Sigh. The “carbon market” isn’t a market. It’s a game of musical chairs controlled by bureaucrats. They remove a chair (cut the allowances), so players fight for the remaining chairs (raise the CO2 price) until one player drops out (fossil fuel demand drops). This decision stops them from removing another chair – for the time being – so no-one now has to fight for a chair. But all the bureaucrats have to do is to remove another chair, and the game is on again. Unlike the children’s game in which the one on the last chair is the winner, in this game they want to remove the last chair too (total destruction of all the world’s economies). How long are we going to waste euros, dollars and yen bailing out before we realize Ronald Reagan was right about this just piling up debt? Remember all the websites offering “carbon footprint” offsets where they plant trees in your area in return for your cash! When the scam pushes the price of energy up and promotes trees for fuel, What happens to the trees? and who gets the money? The collapse of the EU price leaves Australia sitting there like a shag on a rock with a CO2 tax at $23 per tonne. Canberra is located very near to La-la land. Sorry Kurt, that’s a train coming! A scam that not even the scammers can make money out of. Well, y’all know, the coming collapse of the carbon ponzi scheme must be due to global warming! And since global warming is the root of all evil, it must also have been responsible for the Boston Marathon bombings. Obviously, in th enviro mind, global warming must have replaced God, or nature, as the driver of all things. /sarc (sort of). Does anyone from Europe have access to a longer timeline for the EUA? Point Carbon requires a subscription and I flat out refuse. This long winter is hard to ignore. 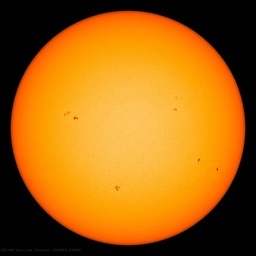 In light of the fact that co2 hasn’t been able to keep up it,s reputation as the Earth,s ‘other sun’, the fog of deception is lifting on the reality of climate change. Tallbloke has the right idea … let the fools who think it’s worth it buy up all the “allowances” at the current price, trying to prevent the plummet to absolute junk value… The fiat currency has no real value if people don’t give it any value. The EU has, as yet, only indirect powers to force compliance … but as one sees from e.g. Spain, the nominal “penalties” for non-compliance are simply allowed to accummulate without limits. Countries like Spain only pay lip service to the EU. On Thursdays. The EU in its current form is well past its use-by date anyway. Disposing of the mess is going to get expensive. The market has already split the value of the “common currency” North/South. It takes more Euros to buy something in “Club Med” than what it does in Germany. The EU’s push for bank union throughout the EU is now clearly visible as a further grab for power by the feckless EU and the savings of people who put money away for a rainy day. Manipulation of the gold price in the EU, by the EU through e.g. forced divestment of e.g. Cyprus’ gold reserves and persuasion of the lamestream media that gold isn’t worth anything is to persuade people that the worthless Euro is a better investment. It isn’t. Deutsche Bank’s risk exposure via derivatives is in the trillions of Euros. The European Central Bank (ECB) as well as national reserve banks have permitted the “creation” of more virtual money than is likely to exist as real wealth in today’s money. Socio-political instability is predicted by some to bring civil unrest and civil war. So much for the glorious peaceful Europe that Germany’s former Chancellor Kohl etc. banked on when deciding that monetary union would provide social and political stability for the hundreds of different peoples of the continent. There are calls for Nuremberg-like trials for the instigators, those who introduced and undemocratically imposed the use of a foreign currency on Germany. That’s two big hits for European organised crime. (Brussels is disorganised crime). Firstly, a lot of hot money has been trapped in Cyprus. Secondly, the Russian and Balkans Mafia are heavily involved in the corruption of the Carbon Credit Trading scheme. The news is not all bad. April 16, 2013 at 9:51 am. Cotton wool doesn’t thud. April 16, 2013 at 10:55 am. As a man of the Cloth, you may wish to lead Prayers for the 400,000,000 souls who will have been committed to Third-world poverty for generations when the Euro collapses. Then donate the collection to poverty alleviation in Europe. Yes we need a ‘light on the hill’.We have a luckless and lacklustre Federal government, however we are the ‘Lucky Country’ and teeming millions of us are yearning for change. Remember the Roberts rule (John Roberts, Chief Justice US Supreme Court): as long as they call it a “tax”, the government can assume any power, even if specifically prohibited in other parts of the Constitution. SAN FRANCISCO, April 16 (Reuters Point Carbon) – A coalition of businesses and trade groups on Tuesday filed a lawsuit in state superior court challenging California’s carbon permit auctions, calling them an unconstitutional state tax. If Roberts rule applies and they call it a tax then the California constitution directly prohibits the carbon market from operating in our state. The State legislature can not raise a tax in California without a direct referendum vote of the people. We won. It is over. The carbon communists have lost big time. Soon the only people who will preach CO2 pollution will be soon to be ex-polititians, malthusians sequestered away in socialist onclaves (think Nancy Pelosi), and dinosaurs like John Kerry (who might appear to have been promoted, but if you look real close John doesn’t have a Senate seat anymore. Now would be the time to drink the champaign, friends. Pull that cork! Smoke em if you got em. Also – ‘light at the end of the tunnel’ for the euro..? Yep – it’ll burst into the daylight and shatter into its original seventeen currencies..! Posters are missing the point here, which is that the EU Commission which holds all the power doesn’t need to take any account of the market. They were not democratically elected, and the MEPs have no power at all. Until the nations which form the EU elect parties which will secede, the Commissioners still hold all the power in Europe. It is they who make the laws, regardless of market forces – and they are still committed to the religion of CAGW with all its tax and political benefits to them. This is not over yet, by a long way. The first requirement is for the real science regarding relationships (or lack of them) between CO2, solar and other influences, and natural climate variation to penetrate the skulls of the electorates and those tribal voters who vote for national parliaments which act against their own and their nations’ interests.